I remember how it was. Before there was a war raging between three Next Gen titans (Sony, Microsoft, and Nintendo), it was all about Mario versus Sonic. Suffice to say, I am extremely familiar with both. I’ve dabbled in the school of Super Mario Bros from the original NES classic to Super Mario Galaxy 2. And similarly, I’ve seen Sonic the Hedgehog evolve from two-dimensional side-scrolling platforming goodness to his greatest (and most controversial) three-dimensional adventures. I have my favorites, of course, but the fact is—I have a history. I even played the game at E3, so I knew what to expect before sitting down with the full game. 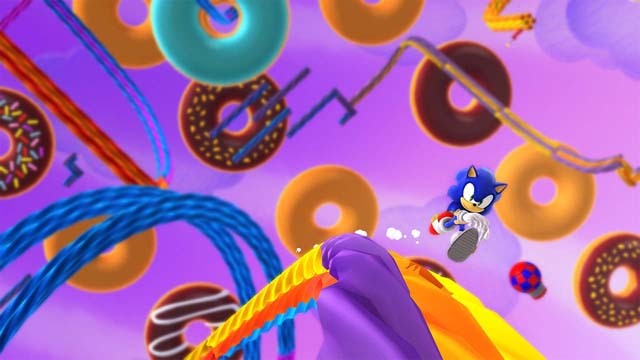 But there’s so much to say about Sonic’s latest outing on the Wii U. At times, I felt like I was experiencing Sonic the Hedgehog’s finest hour(s)… and at times, I wanted the hours to be up. I hope you’ll hear me out, because whether you’re a longtime fan of the blur blue or a newcomer looking for the next classic title on Wii U…I’m speaking to everyone this time around. Shall I get the obvious out of the way? 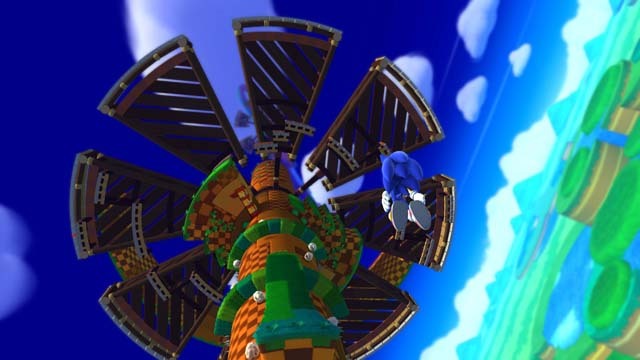 Sonic Lost World borrows a page from Super Mario Galaxy and its sequel. It’s been said to death, at this point. You can see it in trailers and screenshots before you even sit down with the game for the first time. 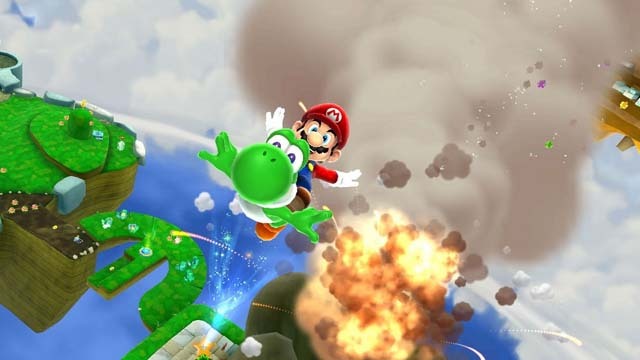 But, as devoted Nintendo fans know very well—there wasn’t much to Mario’s transition from the three-dimensional world of Super Mario 64 or Super Mario Sunshine to the gravity-powered, super-tight-physics-powered, “holy-crap-I’m-walking-upside-down”-powered world of the Galaxy games. From the get-go, Mario’s controls felt natural, in my opinion. Rather than open this review on a positive note, I’m going to get the glaring negative out of the way before I even talk about all that’s wildly impressed me: the controls brought about by the new physics and mechanics presented by Sonic Lost World are an extremely harsh barrier of entry that will frustrate even the most die-hard Sonic fans in the beginning. 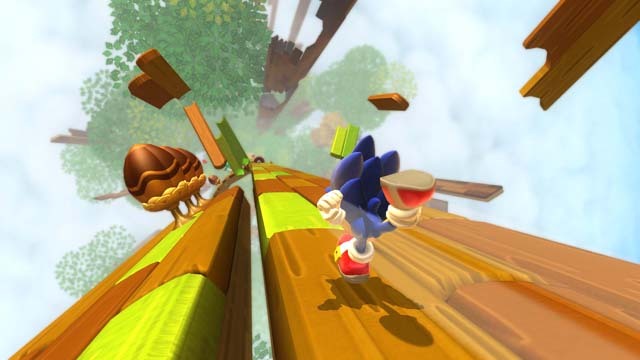 Even those who have never touched a Sonic game before should know he’s all about speed. And trust me, the speed in Lost World is definitely there—it’s just not as immediately apparent. I thought back to when I first played the demo at E3. Without instruction or tutorials (and the full game provides very little guidance), I simply had Sonic walking from Point A to Point B, wondering when the speed and momentum would kick in. As it turns out, the ZR trigger on the Wii U Gamepad is Sonic’s means to run. By holding down that button (constantly), Sonic offers the speed that longtime fans are used to, and that newcomers expect. 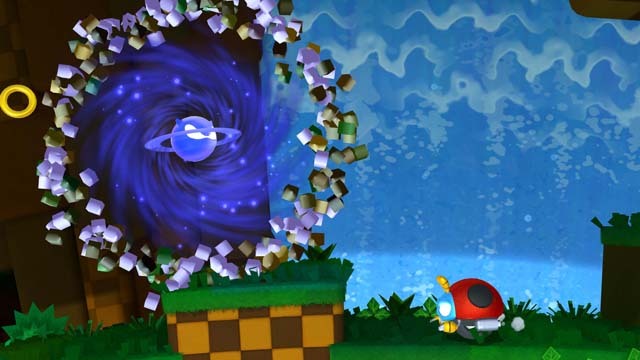 But given the complexities of the many planetoids Sonic bounces from, you’re often set to slow down and handle a few tricky jumps (or foes) in order to advance…or collect the game’s many red rings (replay value and incentive for certain unlockables like in Sonic Colors and Sonic Generations that came before it). So just when you have enough momentum, you’re forced to halt…then build it up again, then…oh crap, wall/death pit/insert other cruel hazard here. If the controls were easier to master, various hazards would be fun to avoid. But the controls aren’t as tight as I’d like them to be, and require a specific finesse that not many will have in order to master. I find myself more relieved than exhilarated by the end of certain stages. I’ve spent hours replaying levels and grappling with the new way Sonic jumps to defeat foes. With the “X” button, he performs a simple homing attack (or jumps). The “Y” button allows him not only to hone-in on an enemy, but to grab them and fling them in any given direction as well. Sometimes, finesse with the X and Y buttons are needed to defeat enemies. If there aren’t any enemies to zero in on, Sonic simply bounces (a maximum of three times before stopping) if one mashes the Y button. Spin-dashing, instead of the DOWN+A combination that many are used to, is reserved for the ZL trigger on the Gamepad. One thing that impressed me about the new physics: rings come towards you if you go fast enough; if you propel towards an enemy with enough force, you’ll take out a ton at once. Momentum is definitely a key to understanding the new Sonic. …this is the best Sonic game in years. If you look past the controls, other elements of gameplay and level design offer some of the greatest leaps forward I’ve ever seen in a Sonic game. Some of these levels far surpass Sonic Colors or Sonic Generations. 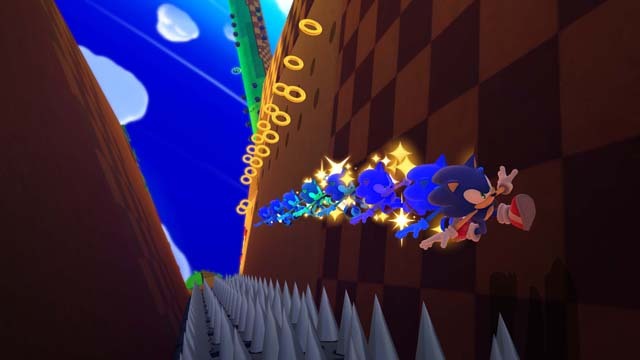 They take various tropes you’d expect in a Sonic game like a grinding level or an auto-running level and they show off the best possible ways to execute them. I spoke before about being relieved, but most of the time I finished each level with a goofy smile on my face like, “That couldn’t have been better.” The physics and “evolution” of Sonic in this game may have borrowed from Nintendo’s book, but the individual levels and the “Worlds” they populate are a testament that Sonic hasn’t forgotten its charm over the years. 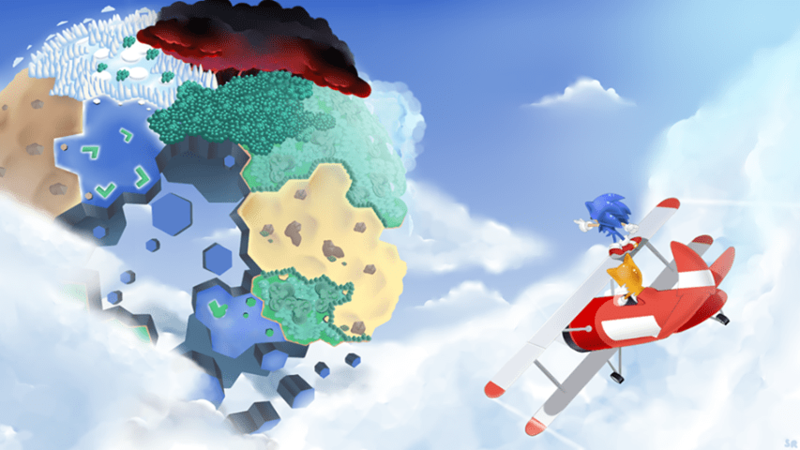 The game will have you powering through your conventional Green Hill-esqe fare, then take you through deserts, desserts, dense forests, frozen factories, to the skies, and beyond. 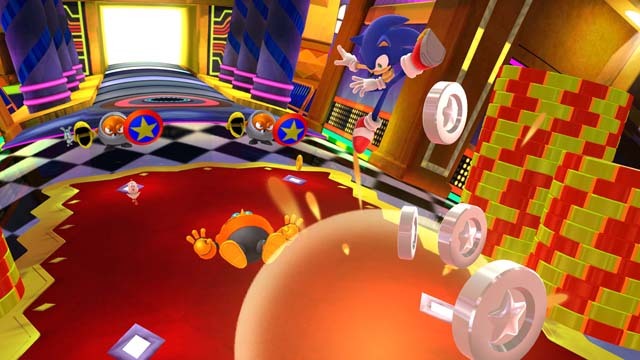 Sonic and Tails find themselves on The Lost Hex after Eggman, but the story of the game ends up leaving Sonic and Eggman on the same side as they face The Deadly Six. The plot (and the voice acting) actually far exceeded my expectations. I know they’re doing something different when I find myself more sympathetic (or in admiration) towards Eggman versus Sonic. 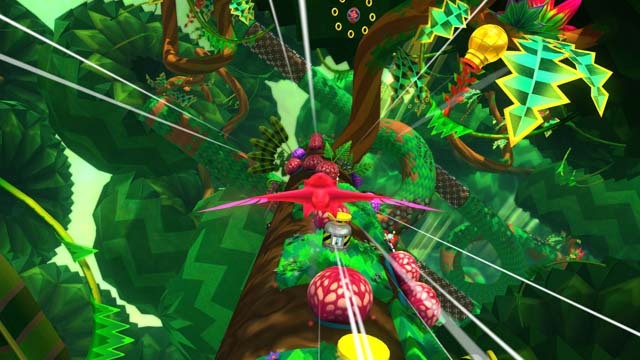 It’s a fun romp, if not what you’d expect from a game as colorful and whimsical as this one. Newcomers will be delighted with its somewhat campy attitude, I think. Sonic doesn’t simply have antagonizing chats with The Deadly Six, though. 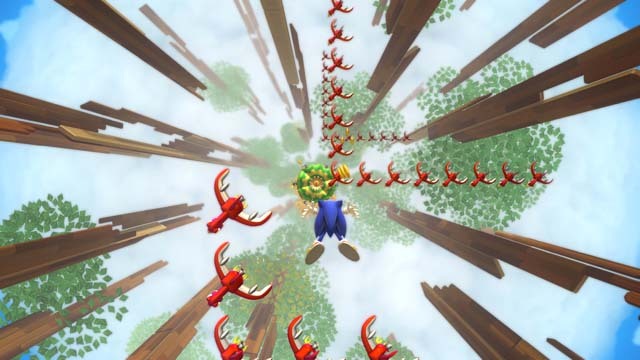 The second and forth levels of each World feature a boss at the end. 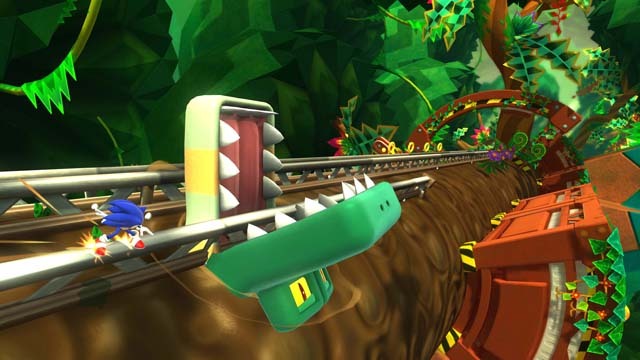 Some of the challenges The Deadly Six yield offer a chance for Sonic Lost World to break free of its controls in favor of experimentation and new ways to mix up gameplay. A lot of these boss levels are some of my favorite in the game, a testament to what makes Sonic Lost World shine among its contemporaries. Who doesn’t like racing down a series of honey-combs or rolling around as a giant snowball? I didn’t even mention Wisps until now, which make a return from Sonic Colors (many are brand new) and give the Gamepad a use every now and again. Speaking of the Gamepad: Off-TV Play is supported fully (and thank goodness, because a big chunk of my gameplay experience utilized it), and fortunately or unfortunately (a matter of perspective), the Wii U Pro Controller isn’t supported in Single Player mode. I suppose with everything the Wisps do involving the Gamepad (tilt and touch your way to victory), that’s to be expected, right? Just a few more things to note before I wrap this game’s beautiful presentation in a bow in affect to end this experience on a positive note. One more thing Sonic Lost World changes in terms of things Sonic fans expect: 100 rings doesn’t grant you an extra life. I’d gripe and tell you that lives are hard to come by (and they are in the beginning, truly), but as soon as you reach the third world (less than half-way through the entire game), there’s a level that hands out lives like candy. Further, lives and other items can come to you via White Wisps, a handy way the game integrates Miiverse. The one true gripe I have with this game is the animal collecting. In previous Sonic games, you kill enemies to free your animal friends inside them. 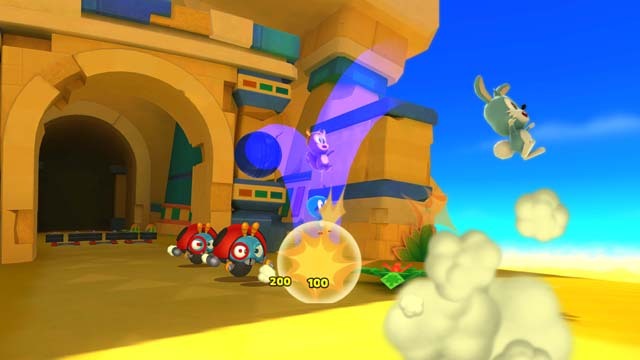 In Sonic Lost World, enemies defeated/animals freed are quantified, and you’re expected to free a certain amount of animal-friends before you can progress to the final level of each world. It starts out balanced enough, but as you move towards the end of the game, the enemy/animal count becomes laughably unbalanced, and you’re essentially forced to play through each level normally and mash as many enemies as you can to reach ludicrous goals. Since enemies aren’t calculated in time attack or the various other modes of play, it just…counts as a strike against the game, at the end of the day. I don’t need artificial means to increase the length of a Sonic game—the levels alone should be enough. They are enough, though! The graphics are visually stunning, the soundtrack is extremely catchy (there’s not a single dud in the mix; as a matter of fact, they get more impressive as the game goes on). If you wrap it all up in the design and presentation I’ve been praising for a while, the presentation makes it well-worth the asking price, especially for Sonic fans curious to try the next evolution in “blue blur gaming”. I can’t express enough how much fun I’m having, which is why it disappoints me so much that the controls (and the mechanics necessary because of the controls) take so much effort to master. This is a game worthy of Galaxy-levels of praise that’s held back by controls/mechanics that are sometimes so badly implemented that the vast majority of newcomers (or those used to calling a Sonic game inherently bad) will write it off. Is all hope lost for Sonic Lost World? Looking back at my entire experience, I had way more fun than I had trouble. But these controls are certainly more trouble than they’re worth, sometimes. I want everyone to experience this game, so they can hopefully find the same level of enjoyment that I did by the time it was over, but I know full well how much controls mean in a platformer. 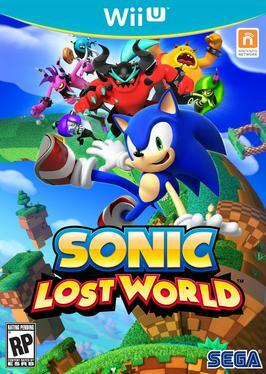 Not everyone will like Sonic Lost World, and not everyone should. But despite a few missteps, this is a very solid entry in the franchise that shows SEGA’s best foot forward (even if, to some, that foot forward will step into a badly-placed pitfall). Review copy provided by SEGA.